This movement moment is calling on those of us who believe in the vision of Dr. King to respond. This movement moment is calling on us resist. But, what does resistance look like? We live in a time where those who have the illusion of power attempt to continue their authoritarian rule with increased militarism at home and abroad. We live in a time where those in government and corporate America continue to evade the global environmental crisis, while flip flopping sides on where they stand, leaving the American people to suffer as a result of their indifference. It is no coincidence that we continue to experience this never-ending turmoil in America. America has not been honest with herself when it comes to her identity as a country, her coming into being, or the violence she inflicted and maintains at home and abroad in order to continue to exist in the way that she has since her inception. Many have been harmed and killed by the values carried forward by pursuit of the American Dream. In order for us to transform this country we have to start being honest about what we stand for. It is time that we had very frank conversations about the condition of this country. It is time that we had brave conversations about the fear that sparks racial divide. It is time that we had honest conversations about the individualism that feeds capitalism and its toxic relationship to racism. It is time that we had real conversations about the misinformation perpetuated in the mass media and regurgitated in our homes and our communities about various cultures and identities that incubates ignorance and encourages violence. By 1968, Dr. King was calling on this country to have a radical revolution of values. He was calling on us to do more than build non-profits, coalitions and allegiances. He was calling on us to do more than become allies and good samaritans. 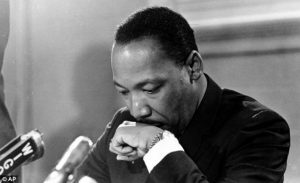 Dr. King was calling on us to look inside ourselves, to look at our own humanity and resist a society, a country that would allow so many people to gain wealth at the expense of other people. Of course now we know that it has been at the expense of all living beings. Our land has suffered. Our air has suffered. Our water has suffered. Our humanity has suffered. Right now, we are witnessing within the White House an increased investment in the 1% by President Elect Trump. This is a repeat of what we have witnessed from the top time and time again. It begs the question, what are the rest of us willing to invest in?